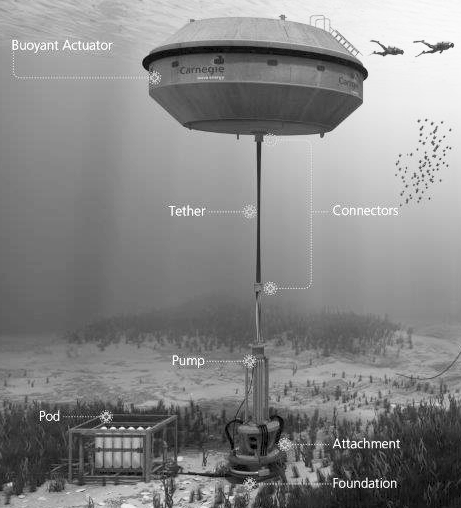 Wave energy generators obtain their energy from the tides. Recently, the world’s first grid-tied wave generators were turned on near the coast of Australia. They provide 240kW of power and desalinate water by harnessing the movement of the oceans to drive a pump using a buoy. The water travels through a pipe to the nearby shore and drives a hydroelectric turbine or desalination process. The latter step gives it the advantage of generating its electricity using highly-developed, existing technology with only the “fuel” supply being experimental. This technology is called a “point absorber” buoy, and there are many possible configurations for a wave energy generator. Wave power provides an additional complement to the suite of existing solar, wind, and geothermal technologies that are set to replace fossil fuel power. Wave power has the advantage of being continuous and predictable, which is a great reason to use it in addition to the other renewable technologies. Direct-drive wind power has been driving the operation of factories for about 900 years. Unlike modern wind power, in which mechanical energy drives a turbine to produce electricity, often to drive an electric motor to produce mechanical energy, resulting in nearly 20% of the energy being wasted, these traditional, turbineless wind mills powered mechanical machine tools directly, using the mechanical energy it has already harvested from the wind. 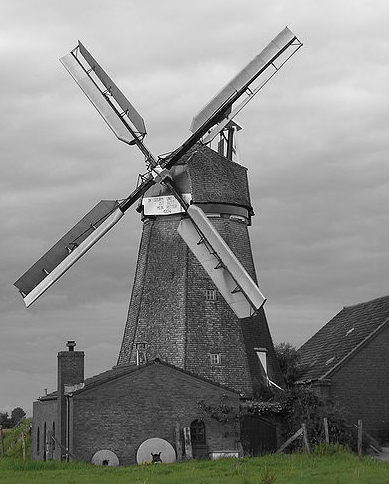 The Dutch continued to develop this technology into the 1940s, resulting in windmills such as the one pictured at the right, a strange mix of modern and traditional technology. This technology is not obsolete, however; it has merely been forgotten due to the glut of cheap fossil fuels that provide more ‘efficient’ energy by ignoring the costs of its use. With direct-drive wind technology, we can not only achieve higher efficiencies, but we can do so with fewer advanced materials, which means less fossil fuel and less mining involved in its production, as well as in the production of the tools that would use mechanical energy as their input.